Does anybody use the PDF version I provide? Hey blogging friends, I don’t know who out there are friends with Donald Norris at My Heart Is For Israel, but I have a brief update for you if you are. As you may know, he recently had some back surgery; well, he now has a staph infection at the surgery site and is in the hospital since Sunday. Except for a few minutes the last two days, he has been in the bed. Right now he is scheduled to have an additional surgery to clean out the infection in his back; that will be at 200 pm Pacific time tomorrow. He also may have to go to a rehab center when they release him if he cannot walk by then. He says he will catch up on reading as soon as he feels able. In the meantime, prayers would certainly be in order. In my last post, we concluded our exploration of Messianic Jews 9:1-10 the Temporary Levitical Sacrifices. In this post, we examine Messianic Jews 9:11-14 concerning The Eternal Heavenly Sacrifice of Yeshua. We must remember three things which are basic to the thought of the author to the Hebrews. Religion is access to God. 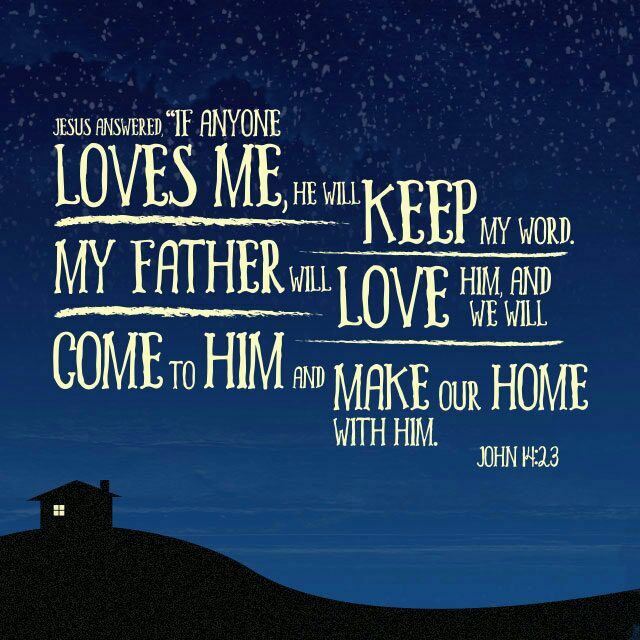 Its function is to bring a man into God’s presence. This is a world of pale shadows and imperfect copies; beyond is the world of realities. The function of all worship is to bring men into contact with the eternal realities. That was what the worship of the Tabernacle was meant to do, but the earthly Tabernacle and its worship are pale copies of the real Tabernacle and its worship, and only the real Tabernacle and the real worship can give access to reality. There can be no religion without sacrifice. Purity is a costly thing; access to God demands purity; somehow man’s sin must be atoned for and his uncleanness cleansed. 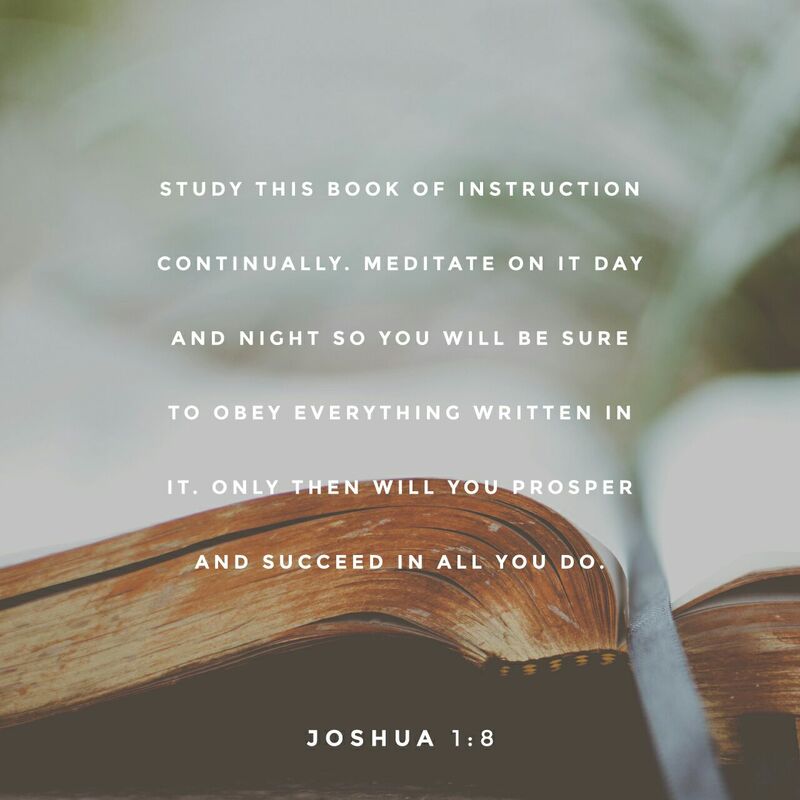 With these ideas in his mind, the author to the Hebrews goes on to show that Yeshua is the only High Priest who brings a sacrifice that can open the way to God and that that sacrifice is himself. I confess that I get goose-bumps when I read this passage. The enormity of its implications is almost beyond my ability to grasp. With Yeshua arrive the good things that are happening already. The entire discussion that follows, through 10:18, demonstrates that these things are better than what came with the Mosaic Covenant’s system of cohenhood and sacrifices. Yeshua serves in a better Tent. It is greater, more perfect, and not manmade (that is, it is not of this created world). Moreover, it is not merely a copy of the actual Tent, but the heavenly original. Yeshua, unlike the Mosaic cohen hagadol, has entered into the Holiest Place once and for all. His single, unique and eternally effective sacrifice and entry into the Holiest Place is discussed further at 9:25-28, 10:10-18. His own blood, not the blood of goats, calves, and bulls and the ashes of a heifer. The blood of any other human being would not only have been an abomination itself but would have accomplished nothing useful for others. But because Yeshua was sinless, He was a sacrifice without blemish, and God accepted His shed blood (see 7:26-28). His sacrifice was through the eternal Spirit authorized by God. His death was necessary to set people free from the transgressions they have committed under the first covenant. The ineffectiveness of animal sacrifices in comparison with Yeshua’s sacrifice is taken up again at 10:1-4. What Yeshua’s death accomplished is better than what the death of animals accomplishes: setting people free forever and purifying our conscience from works that lead to death, so that we can serve the living God, versus not having our conscience brought to the goal and instead merely restoring outward purity. Restores their outward purity means that they may enter the Temple as ceremonially clean. According to Numbers 19, anyone defiled by contact with or proximity to a corpse was ritually cleansed by sprinkling him with water containing the ashes of a heifer. Verse 14 offers us a further glimpse of the Trinity: the Messiah, the eternal Spirit and God (likewise 10:29). The ancient sacrifices may have cleansed us from ceremonial uncleanness; the sacrifice of Yeshua cleanses our soul. Our body might be clean ceremonially, and yet our heart is full of deceit. We might feel able to enter the Tabernacle and yet far away from the presence of God. The sacrifice of Yeshua takes a load of guilt from our conscience. The animal sacrifices of the Mosaic Covenant might well leave us in estrangement from God; the sacrifice of Yeshua shows us a God whose arms are always outstretched and in whose heart is only love. As Believer’s in Yeshua, we have been redeemed by and washed clean by His blood. In my next post, we’ll continue our mini-series on Yeshua: His Better Covenant which will cover Messianic Jews 9:15-22 ~ The New Covenant Validated by the Death of Yeshua. 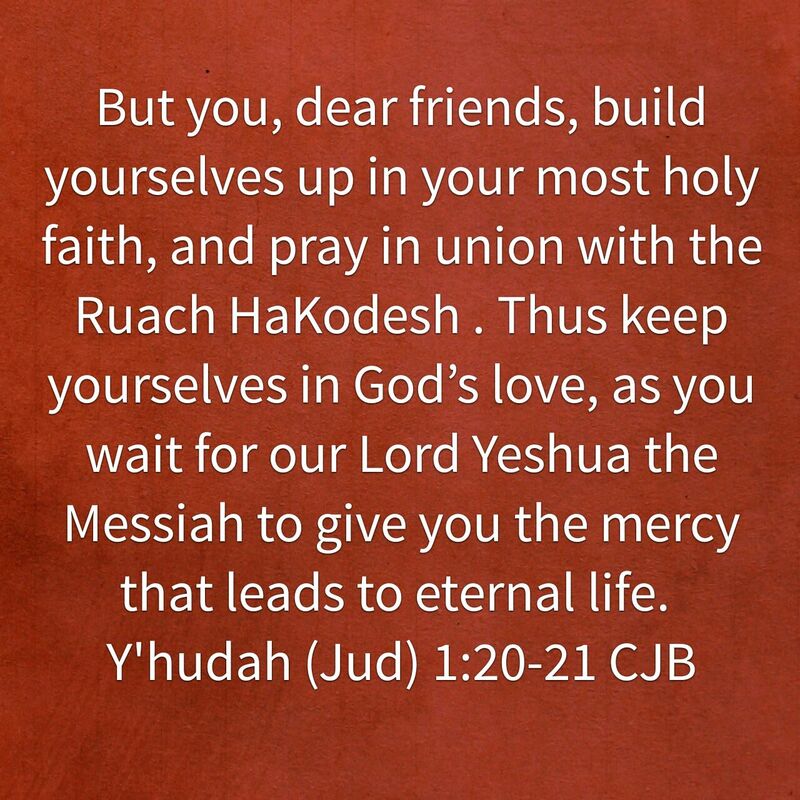 But you, dear friends, build yourselves up in your most holy faith, and pray in union with the Ruach HaKodesh . Thus keep yourselves in God’s love, as you wait for our Lord Yeshua the Messiah to give you the mercy that leads to eternal life. 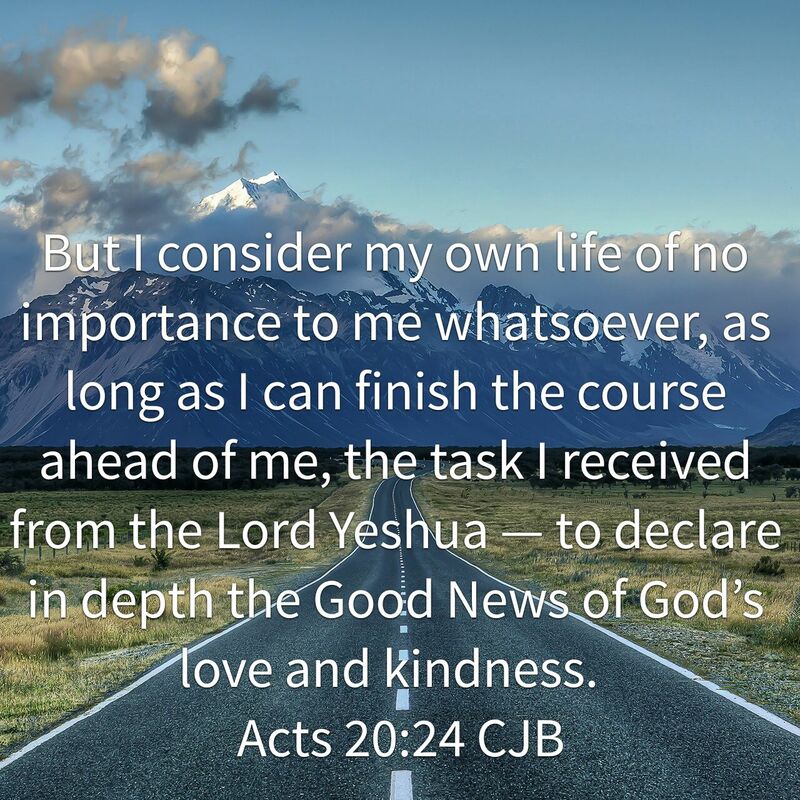 But I consider my own life of no importance to me whatsoever, as long as I can finish the course ahead of me, the task I received from the Lord Yeshua — to declare in depth the Good News of God’s love and kindness. Please be in prayer for a fellow blogger who is recovering from heart procedures. Hey everyone, we’ll the last 2 days have been interesting to say the least. The last 60 days I’ve been struggling with some chest pain, after a visit with my Cardiologist we were waiting for approval for a cardio-catheter test to be approved. Well, after walking from the living room to the kitchen, 911 needed to be called Wednesday night. God bless those men and women, they were part of everyone saving my life. The tests were done and 3 blockages were revealed. The doctors were amazed I was still alive. An Angioplasty catheter was successfully performed and 2 stents have been inserted, 1 more to be done in the upcoming weeks. Pastor Jim at Domain for Truth and Brother Wally thank you for all your prayers, I love you guys. Now that I’m making this known to everyone, please join in Prayer, not just me but for all us. I decided to give my blog a new look to celebrate the beginning of my third year as a regular blogger. I hope you enjoy it. Let your heart be still as you listen to this message of God’s love for you. Your life will be changed. Very much a worthy message.